Visitors explore the gallery during a Free Family Day event. Photo by J Caldwell. 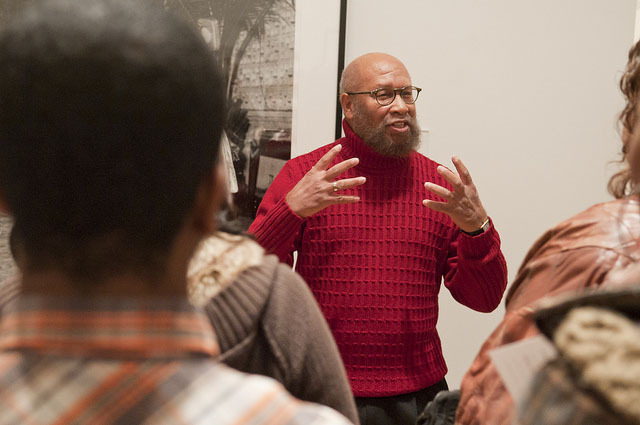 Dr. Kenneth Montague, who organized the exhibition from his own collection, makes remarks at the opening event. Photo by J Caldwell. 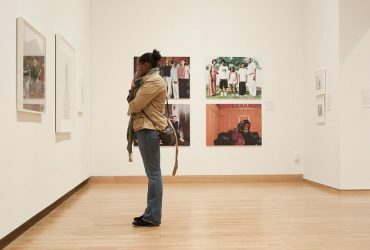 Becoming: Photographs from the Wedge Collection was a significant exhibition, well suited for Durham and rare for a regional art museum, featuring more than 100 original photographic portraits of people of color. The portraits were taken over the past 100 years by more than 60 global artists. 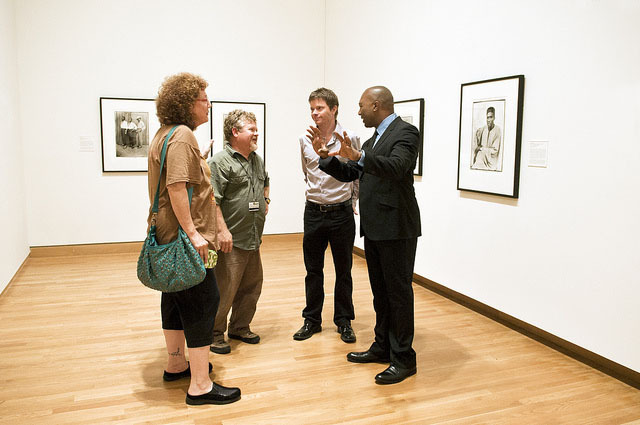 In some of the portraits, the subjects have little or no control over the way they were depicted; in others, the subjects become increasingly involved with the photographer. All of the artists reject a common tendency to view black communities in terms of conflict or stereotype. 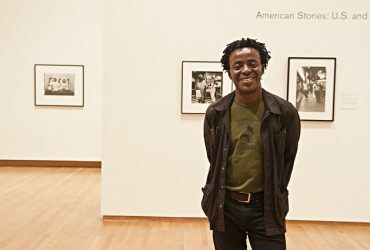 Becoming included studio portraitists (Malick Sidibé, James VanDerZee), social documentarians (Milton Rogovin, Jürgen Schadeberg), conceptual artists (Hank Willis Thomas, Carrie Mae Weems) and young contemporary artists whose work is largely unknown in this country (Zanele Muholi, Viviane Sassen). 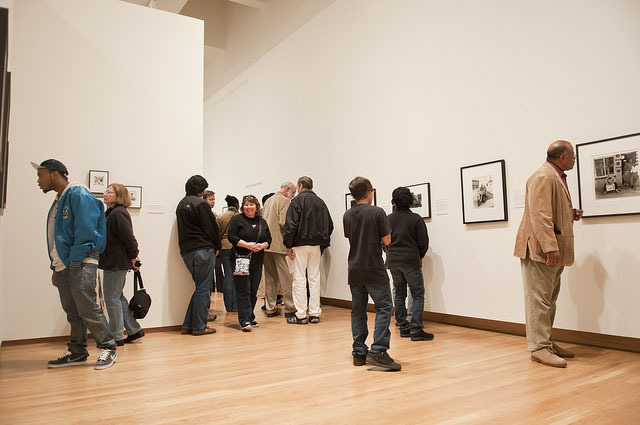 A young visitor with his mother explores the gallery during a Free Family Day event. Photo by J Caldwell. 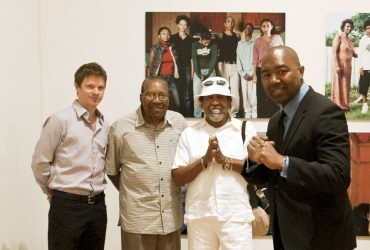 The work was on loan from the collection of Dr. Kenneth Montague, who organized the exhibition. Montague, a dentist based in Toronto, has collected contemporary art since the 1990s. He grew up in the Canadian border town of Windsor, where he was influenced by the African American culture across the river, in Detroit. Learn more about his collection and Wedge Curatorial Projects. 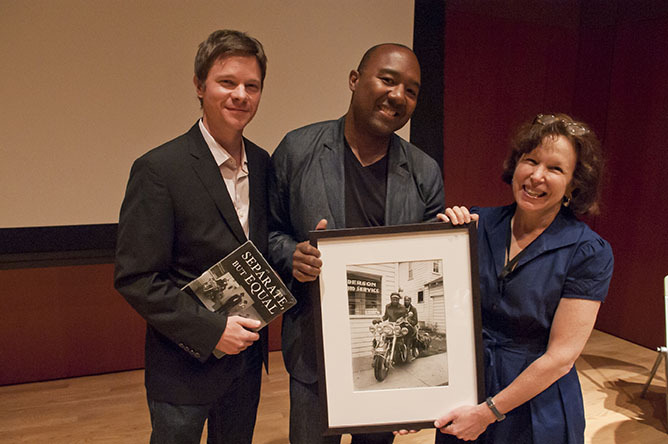 Becoming was supported by Paula and Eugene Flood, the Graduate Liberal Studies program at Duke University, and Gail Belvett, DDS. Curator Trevor Schoonmaker (left) accepts the gift of a photograph from Dr. Kenneth Montague with Nasher Museum Director Kim Rorschach. Photo by J Caldwell. 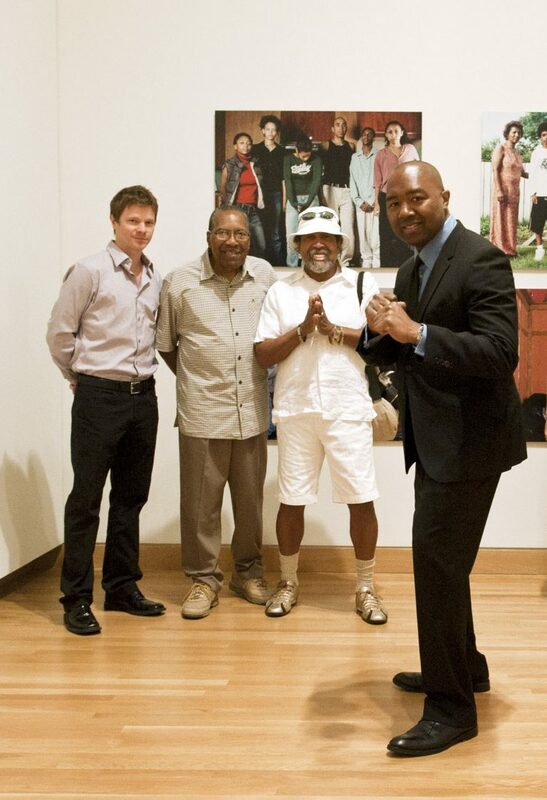 Collector Dr. Kenneth Montague (front, right) poses in the gallery with (from left) Chief Curator Trevor Schoonmaker; Spurgeon Montague, the collector’s father; and artist Barkley L. Hendricks. Photo by J Caldwell. A student visiting from North Carolina Central University spends time with the work. Photo by J Caldwell. This scene is from Art for All: Double Exposure, an evening of fun and photography at the NCCU Art Museum and the Nasher Museum. Students from both campuses and members of the community took part in gallery talks, a free photo-booth, spoken word poetry, live jazz, scavenger hunts and refreshments (including tiny gelato cones). Crowds took free buses back and forth between both university art museums all evening. Photo by J Caldwell. 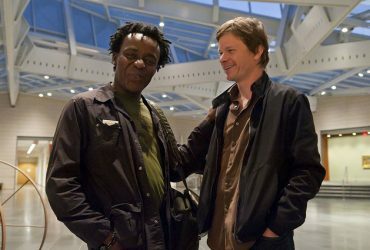 Celebrated British filmmaker John Akomfrah chats with Chief Curator Trevor Schoonmaker before the screening of his film and accompanying talk. Photo by J Caldwell. 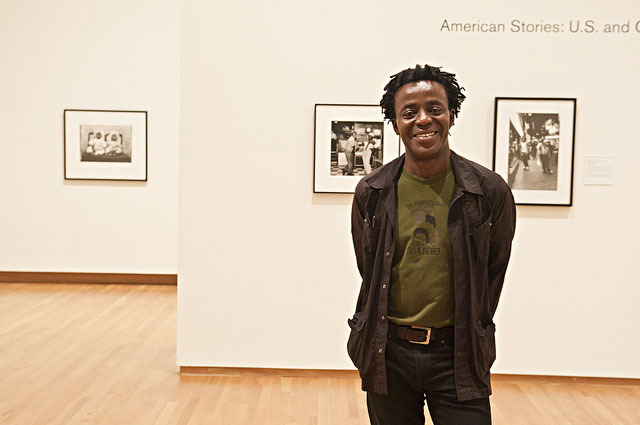 Celebrated British filmmaker John Akomfrah visits the exhibition. Photo by J Caldwell. 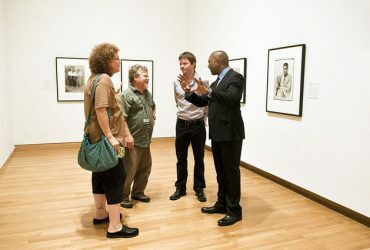 Collector Dr. Kenneth Montague (right) chats in the gallery with (from left) Susan Hendricks, Exhibition Designer Brad Johnson and Chief Curator Trevor Schoonmaker. Photo by J Caldwell. 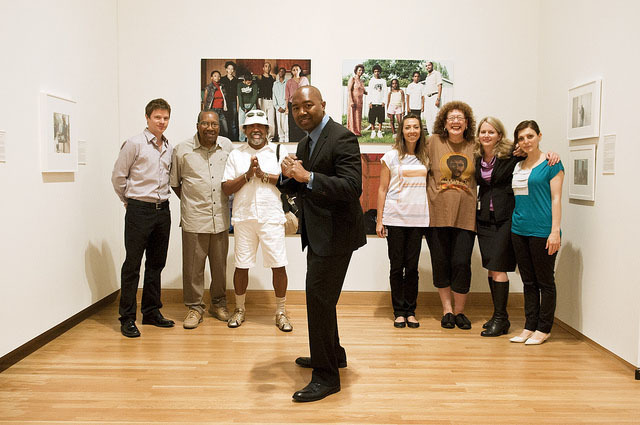 On the occasion of Becoming: Photographs from the Wedge Collection, collector Dr. Kenneth Montague (front) visits the gallery with (from left) Chief Curator Trevor Schoonmaker; Spurgeon Montague, the collector’s father; artist Barkley L. Hendricks; Reneé Cagnina Haynes, Exhibitions and Publications Manager; Susan Hendricks, the artist’s wife; Wendy Hower, Director of Engagement and Marketing, and Maria Kanellopoulos, Wedge Collection assistant. Photo by J Caldwell. 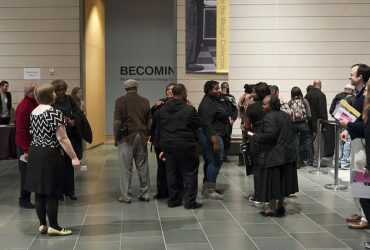 Becoming was complemented by free programs, including a conversation with Kenneth Montague and Trevor Schoonmaker; a Family Day, a talk by British filmmaker John Akomfrah; a gallery talk by Duke Professor Richard J. Powell; and a joint event with students at Duke and North Carolina Central University.